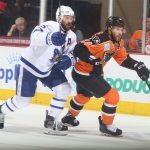 Eastern Conference Finals Continues with Game 4 Friday at PPL Center May 23, 2018 Lehigh Valley, Pa. – The Toronto Marlies scored just over a minute into Wednesday evening’s showdown and added a pair of goals in both the second and third periods en route to a 5-0 victory over the Lehigh Valley Phantoms in Game 3 of the Eastern Conference Finals. With the win, Toronto now leads the best-of-seven series three games to none. The Eastern Conference Finals continue with Game 4 this Friday, May 25 where the Phantoms will look to prolong this series and their season. Friday’s highly-anticipated contest is set to begin at 7:05 p.m. and tickets are currently available by clicking HERE. If Lehigh Valley wins on Friday, the Phantoms would then host Game 5 in downtown Allentown on Saturday, May 26 with tickets for Saturday evening already available HERE. 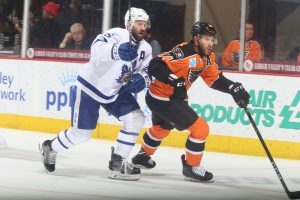 Lehigh Valley will now look to become just the fourth team in AHL Calder Cup playoff history to win a series after trailing three games to none. The feat was most recently accomplished in 2013 by the Wilkes-Barre/Scranton Penguins who erased an 0-3 deficit to the Providence Bruins. In addition, an 0-3 series deficit was also erased by the 1989 Adirondack Red Wings over the Hershey Bears along with the 1960 Rochester Americans against the Cleveland Barons. Ben Smith (4th, 5th) scored twice for the Marlies Wednesday evening while Andreas Johnsson and Carl Grundstrom each added a goal and an assist in front of goaltender Garret Sparks who notched his second shutout of the playoffs turning aside each of Lehigh Valley’s 16 total shots. Meanwhile, Alex Lyon (23 saves) and Dustin Tokarski (6 saves) combined to save 29 or Toronto’s 34 total offerings. 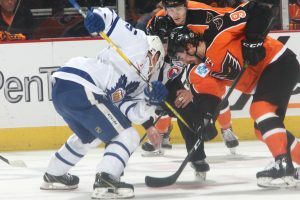 Toronto opened the scoring just over a minute into Game 3 when a giveaway behind the Lehigh Valley net landed on the stick of Johnsson who promptly found Grundstrom who converted his team-leading sixth goal of the playoffs. The even-strength strike came just 1:01 into the contest and marked the second time this series and seventh time this postseason in which the Marlies have fired the game’s opening salvo. Toronto is now 8-0 when scoring first in these playoffs. 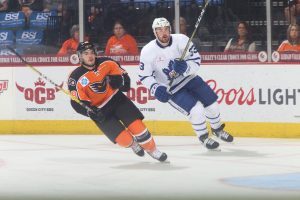 The Marlies doubled their lead less than five minutes into the second period when Johnsson’s wraparound angled off the skate of Lehigh Valley’s Cole Bardreau atop the goal crease before sliding ever so slightly across the goal line. Miro Aaltonen and Grundstrom assisted on Johnsson’s fourth goal of the postseason, which was scored five-on-five 4:50 into the middle stanza. Toronto then swelled its lead to a 3-0 advantage just past the midway point of the contest when a feed from behind the net by Adam Brooks connected with Mason Marchment who promptly slammed home his third goal of the postseason. Trevor Moore collected the secondary assist on the even-strength strike notched 12:32 into the second period. The Marlies then sealed their Game 3 victory with a pair of power play tallies in the third period. After a match penalty for kicking was assessed to Lyon ejecting him from the game, Smith slammed home man-advantage markers 11:08 and 12:29 into the final frame. All told, Toronto’s power play was 2-for-3 Wednesday evening while the Phantoms failed to convert in two power play chances. In the midst of the club’s 12th postseason appearance in franchise history, the Phantoms have captured two Calder Cup Championships (1998, 2005) and carry a 75-57 overall mark in 132 career AHL postseason outings. This is the fifth regular season division title in franchise history and the team’s first since arriving in the Lehigh Valley. Playoff strips, 10-game flex packs, and single game tickets to the 2018 Calder Cup Playoffs are on sale now! For more information on the hottest ticket in town, contact the Phantoms office at 610-224-GOAL . The Phantoms are once again be hosting an Orange Out during each home playoff home this season. Fans are encouraged to wear orange to each and every postseason game at PPL Center as we create the best and most exciting home-ice advantage in the league. The post Quick Start Sparks Toronto in Game 3 appeared first on Lehigh Valley Phantoms.